"The best combo since chocolate and peanut butter"
Two of my favorite new game series in the past decade have to be Professor Layton and the Phoenix Wright Ace Attorney series. These two, which both debuted in the West on the Nintendo DS, raised the bar in terms of storytelling and gameplay on handheld devices. Wright debuted with its courtroom drama during the new IP, new gameplay era early in the DS life with other cemented franchises like Trauma Center and Cooking Mama; while Layton debuted here successfully thanks to its great production values and getting published by Nintendo. Leap forward a handheld generation and these two series are staples to Nintendo fans, and surprisingly got a crossover with one another with Professor Layton vs. Phoenix Wright. So do these two different games meld together? 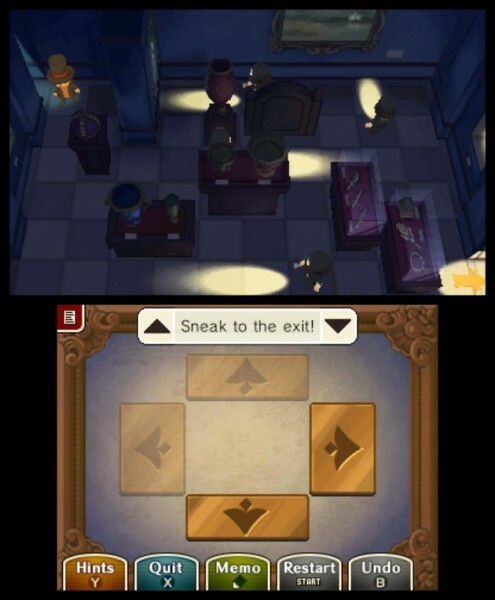 Professor Layton vs. Phoenix Wright takes place in Layton’s home in London where Wright visits for a seminar. They both meet Espella Cantabella on different occasions where they both, alongside their assistants Luke Triton and Maya Fey, get sucked into her book, the Historia Labyrinthia. Here in this medieval city created and maintained by a writer labeled the Storyteller, the heroes must defend Espella from being executed in a witch trial. These two very different guys team up to prevent such a fate, and their gameplay merges into one another nicely. 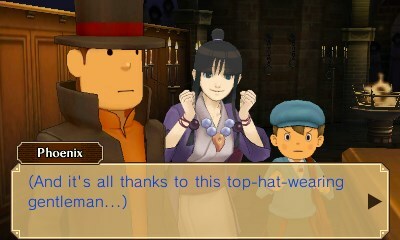 Despite being developed by Level 5, Professor Layton vs. Phoenix Wright plays it safe with the Layton bits. During his lead, you’ll be doing what you have been for six entries: wander around town, talk to people, hunt down hint coins and of course solve puzzles. Despite this being another entry, the formula hasn’t gotten really old, but the puzzles do feel to be toned down and made easier. One thing that wasn’t toned down was the production values. We still get beautiful backdrops, we still get the gorgeous anime cutscenes and the magnificent 3D effect for both. One thing that has changed was the voice cast, since Nintendo localized the already-released European version instead of redubbing it for the US, all four main characters have new actors. Sadly that includes Luke, who now has a very annoyingly squeaky voice. Professor Layton vs. Phoenix Wright paces the Layton parts better because it’s broken up with the Phoenix Wright parts, which casts you into the courtroom for witch trials. Here the real puzzle starts for you fans, you must dissect a witness’ testimony and find contradictions with evidence you have on hand. It’s a battle of logic, and can get really exhilarating when the story picks up and you’re finally on the right track. Don’t mess up too many times because you’re only given five strikes before your reputation goes down the drain. Also leftover strikes are added to your Picarats total, so in traditional Layton fashion, try to aim for the high score. Unlike Layton who’s presence in the game hasn’t really evolved him, Wright fans are in for a unique treat because the Layton parts tend to make the evidence gathering much, much more involving. Usually in Phoenix Wright games, when you are out of the courtroom, the games becomes a point and click adventure trying to find evidence or testimonies. Professor Layton vs. Phoenix Wright enhances that experience with the Layton-powered puzzle solving, because now instead of just chatting, you are actually preforming other mind-bending tasks. Outside puzzles you are exploring the world of Labyrinthia in a similar point and click style, but clicking around may net you extra puzzles, hint coins that can give some help in a puzzle (or for the first time in court by giving away an answer, a little cheap I might add), or at least some nice dialog. 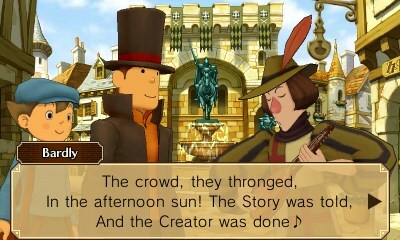 While Layton’s parts just felt like the same Layton, Wright’s courtroom battles were given some significant upgrades. In this game, Wright can now cross examine multiple witnesses at once and use one another’s testimonies against them. 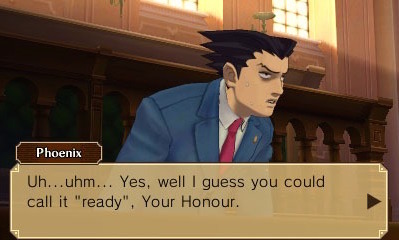 Due to that upgrade, if a witness performs an action during another’s testimony (kinda like in Apollo Justice), Wright can interrupt the current witness and question the other. One last note to mention for Wright fans, due to being developed by Level 5, it was given the Layton treatment of production values, so Wright was given better treatment production-wise than what Capcom ever did. 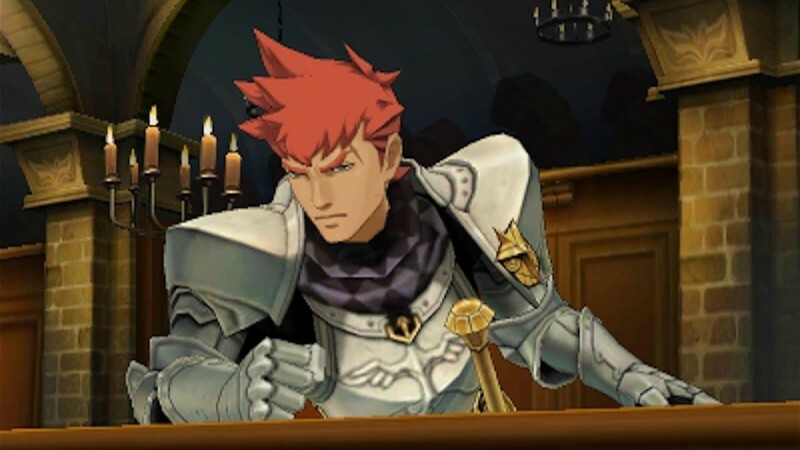 The Wright cast was redone in great 3D models, which really captured what was obtained in the 2D models (even better than Dual Destinies), and the cast was given much more voice acting time. It’s nice seeing VO during the court battles even if it’s brief, and the anime cutscenes give more life to the case, especially Maya, even if her voice actor doesn’t seem into it. If you are both a Phoenix Wright and Professor Layton fan, you shouldn’t be reading this and instead playing the game because for you few, this is a must-own. Even if you’re a fan of only one of the series, it’s worth the purchase because the other games’ play style break and enhance the current flow of what you’re used to, which can feel a bit same-y since each series have had at least six installments. I only hope it makes new Layton fans out of Wright fans and Wright fans out of Layton fans, because if you missed out on either franchise, you’re missing something fun and special. But if you haven’t played either… well it’s time to get playing on those series well before you play this, and it’ll be totally worth it.